Parameter Mappers are used to detect values in your Landing Page URL's Query String, and map those values to Retreaver Tags on a Number. Calls that go through a number automatically inherit all the tags currently on the number. Using Retreaver.js on your landing page in conjunction with a Number Pool allows you to detect unlimited arbitrary values from your landing page URL, helping you determine which clicks are resulting in the most profitable calls. Retreaver extracts Publisher IDs (also known as Affiliate IDs or Source IDs) from your landing page query string using Parameter Mappers. In the image above, we've configured a campaign to detect a Publisher ID from the "afid" parameter of a landing page URL. In the example landing page URL above, we see that the query string of the URL include an "afid" parameter, and we can see that the afid is set to 1234. Retreaver.js will detect this due to the publisher_id to afid mapping, and look for a Publisher with an ID set to 1234. We then attempt to find a matching number, from either a number pool, or a static number assigned to the publisher. Retreaver can extract unlimited arbitrary URL parameters in the same manner, setting tags on numbers for each parameter mapper that's matched. You can even have multiple URL Parameters mapping to the same Tag Key if you use different parameter names on different landing pages. We'll use whichever parameter is found in your landing page query string. Navigate to your Campaign List. Click the "view" button next to your campaign to bring up your Campaign page. Click the Retreaver JS settings tab. Click the Parameter Mappers tab. Click the Edit button, make your changes, and press "Update Campaign". Click the Settings button on the left. Click the green plus sign in the Default URL Parameter Mappers section, make your changes, and click Update Company. Changing the default settings on your company won't affect your existing campaigns. You can edit your landing page URL template in popular tracking systems to pass arbitrary tracking parameters to your landing page for Retreaver.js to detect. 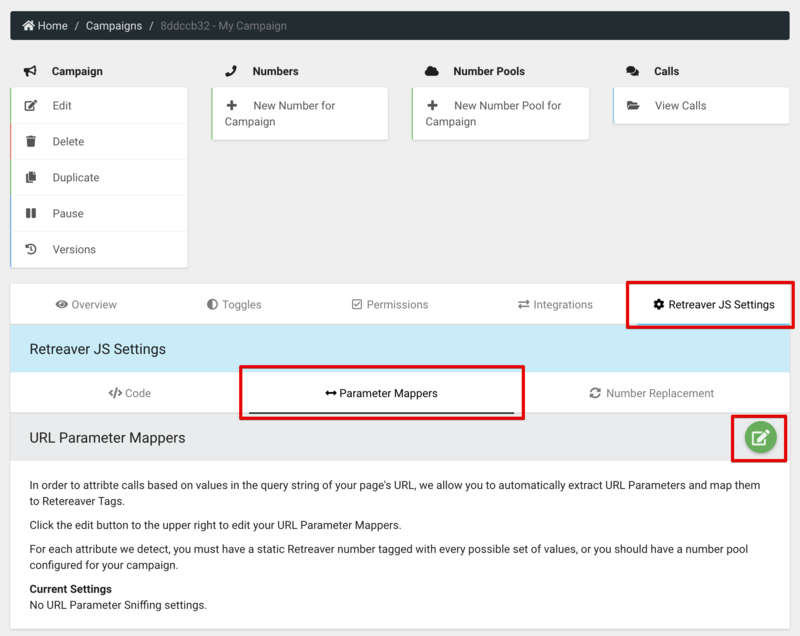 For each parameter, you must have a parameter mapper present on your campaign to turn the parameter into a Retreaver Tag. Google uses "UTM values" to pass data about which ad was clicked. As an example, in LinkTrust you would add ?afid=[=AFID=]&sid=[=SID=] to the end of the landing page URL on the Campaign Edit screen.